Not to be confused with Manuel Palaiologos. Manuel II Palaiologos or Palaeologus (Greek: Μανουήλ Β΄ Παλαιολόγος, Manouēl II Palaiologos) (27 June 1350 – 21 July 1425) was Byzantine Emperor from 1391 to 1425. Shortly before his death he was tonsured a monk and received the name Matthew. He is commemorated on July 21. Manuel II Palaiologos was the second son of Emperor John V Palaiologos and his wife Helena Kantakouzene. His maternal grandparents were Emperor John VI Kantakouzenos (1347–1354) and Irene Asanina. Granted the title of despotēs by his father, the future Manuel II traveled west to seek support for the Byzantine Empire in 1365 and in 1370, serving as governor in Thessalonica from 1369. The failed attempt at usurpation by his older brother Andronikos IV Palaiologos in 1373 led to Manuel's being proclaimed heir and co-emperor of his father. In 1376–1379 and again in 1390 they were supplanted by Andronikos IV and then his son John VII, but Manuel personally defeated his nephew with help from the Republic of Venice in 1390. Although John V had been restored, Manuel was forced to go as an honorary hostage to the court of the Ottoman Sultan Bayezid I at Prousa (Bursa). During his stay, Manuel was forced to participate in the Ottoman campaign that reduced Philadelpheia, the last Byzantine enclave in Anatolia. The coat of arms attributed to the Palaiologoi. Hearing of his father's death in February 1391, Manuel II Palaiologos fled the Ottoman court and secured the capital against any potential claim by his nephew John VII. Although relations with John VII improved, Sultan Bayezid I besieged Constantinople from 1394 to 1402. After some five years of siege, Manuel II entrusted the city to his nephew and embarked (along with a suite of 40 people) on a long trip abroad to seek assistance against the Ottoman Empire from the courts of western Europe, including those of Henry IV of England (making him the only Byzantine emperor ever to visit England – he was welcomed from December 1400 to January 1401 at Eltham Palace, and a joust took place in his honour), Charles VI of France, Sigismund the Holy Roman Emperor, Queen Margaret I of Denmark and king Martin of Aragon. In 1399, the French King Charles VI sent Marshal Jean Le Maingre with six ships carrying 1,200 men from Aigues-Mortes to Constantinople; later 300 men under Seigneur Jean de Chateaumorand remained to defend the city against Bayezid. Meanwhile, an anti-Ottoman crusade led by the Hungarian King Sigismund of Luxemburg failed at the Battle of Nicopolis on 25 September 1396, but the Ottomans were themselves crushingly defeated by Timur at the Battle of Ankara in 1402. Manuel II had sent 10 ships to help in the Crusade of Nicopolis. As the sons of Bayezid I struggled with each other over the succession in the Ottoman Interregnum, John VII was able to secure the return of the European coast of the Sea of Marmara and of Thessalonica to the Byzantine Empire. When Manuel II returned home in 1403, his nephew duly surrendered control of Constantinople and received as a reward the governorship of newly recovered Thessalonica. Manuel also regained from the Ottomans Nesebar (1403–1453), Varna (1403–1415), and the Marmara coast from Scutari to Nicomedia between 1403–1421. Half stavraton coin by Manuel. On the reverse, Manuel's bust. Manuel II Palaiologos used this period of respite to bolster the defences of the Despotate of Morea, where the Byzantine Empire was actually expanding at the expense of the remnants of the Latin Empire. Here Manuel supervised the building of the Hexamilion (six-mile wall) across the Isthmus of Corinth, intended to defend the Peloponnese from the Ottomans. Manuel II stood on friendly terms with the victor in the Ottoman civil war, Mehmed I (1402–1421), but his attempts to meddle in the next contested succession led to a new assault on Constantinople by Murad II (1421–1451) in 1422. During the last years of his life, Manuel II relinquished most official duties to his son and heir John VIII Palaiologos, and went back to Europe searching for assistance against the Ottomans, this time to the King Sigismund of Hungary, staying for two months in his court of Buda. Sigismund (after suffering a defeat against the Turks in the Battle of Nicopolis in 1396) never rejected the possibility of fighting against the Ottoman Empire. However, with the Hussite wars in Bohemia, it was impossible to count on the Czech or German armies, and the Hungarian ones were needed to protect the Kingdom and control the religious conflicts. Unhappily Manuel returned home with empty hands from the Hungarian Kingdom, and in 1424 he and his son were forced to sign an unfavourable peace treaty with the Ottoman Turks, whereby the Byzantine Empire had to pay tribute to the sultan. Manuel II died on 21 July 1425. Manuel II was the author of numerous works of varied character, including letters, poems, a Saint's Life, treatises on theology and rhetoric, and an epitaph for his brother Theodore I Palaiologos and a mirror of prince for his son and heir Ioannes. This mirror of prince has special value, because it is the last sample of this literary genre bequeathed to us by Byzantines. A daughter. Mentioned as the eldest daughter but not named. Possibly confused with Isabella Palaiologina, an illegitimate daughter of Manuel II known to have married Ilario Doria. Constantine Palaiologos. Born ca. 1393/8, died before 1405 in Monemvasia. John VIII Palaiologos (18 December 1392 – 31 October 1448). Byzantine emperor, 1425–1448. Andronikos Palaiologos, Lord of Thessalonica (d. 1429). A second daughter. Also not named in the text. Theodore II Palaiologos, Lord of Morea (d. 1448). Michael Palaiologos. Born 1406/7, died 1409/10 of the plague. 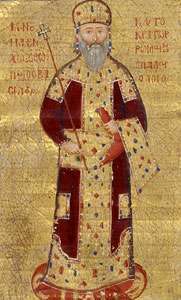 Constantine XI Dragases Palaiologos (8 February 1405 – 29 May 1453). Despotēs in the Morea and subsequently the last Byzantine emperor, 1448–1453. Demetrios Palaiologos (c. 1407–1470). Despotēs in the Morea. Thomas Palaiologos (c. 1409 – 12 May 1465). Despotēs in the Morea. In a lecture delivered on 12 September 2006, Pope Benedict XVI quoted from a dialogue believed to have occurred in 1391 between Manuel II and a Persian scholar and recorded in a book by Manuel II (Dialogue 7 of Twenty-six Dialogues with a Persian) in which the Emperor stated: "Show me just what Muhammad brought that was new and there you will find things only evil and inhuman, such as his command to spread by the sword the faith he preached." Many Muslims were offended by this denigration of Muhammad, and many protested against it. For others it may simply have been false indignation or the assumption of offence by non-Muslims. In his book, Manuel II then continues, claiming that, "God is not pleased by blood – and not acting reasonably is contrary to God's nature. Faith is born of the soul, not the body. Whoever would lead someone to faith needs the ability to speak well and to reason properly, without violence and threats... To convince a reasonable soul, one does not need a strong arm, or weapons of any kind, or any other means of threatening a person with death..."
↑ Great Synaxaristes: (Greek) Ὁ Ὅσιος Μανουὴλ αὐτοκράτωρ Κωνσταντινουπόλεως. 21 Ιουλίου. ΜΕΓΑΣ ΣΥΝΑΞΑΡΙΣΤΗΣ. ↑ Trapp, Erich; Beyer, Hans-Veit; Kaplaneres, Sokrates; Leontiadis, Ioannis (1989). "21490. Παλαιολόγος Κωνσταντῖνος". Prosopographisches Lexikon der Palaiologenzeit (in German). 9. Vienna: Verlag der Österreichischen Akademie der Wissenschaften. ↑ Trapp, Erich; Beyer, Hans-Veit; Kaplaneres, Sokrates; Leontiadis, Ioannis (1989). "21520. <Παλαιολόγος> Μιχαήλ". Prosopographisches Lexikon der Palaiologenzeit (in German). 9. Vienna: Verlag der Österreichischen Akademie der Wissenschaften. Athanasios D. Angelou, Manuel Palaiologos, Dialogue with the Empress - Mother on Marriage. Introduction, Text and Translation, Vienna, Academie der Wissenschaft, Vienna 1991. Wikimedia Commons has media related to Manuel II Palaiologos.